You’ll be amazed at how many emotional strengths there are! Our goal is to help you understand your greatest strengths, grow others, and use them to optimize your emotional health. When we talk about the need for emotional health in pregnancy, the focus is almost always on the negative. Depression. Anxiety. Stress. Worry. But there is another side to emotional health – Emotional Strengths. Emotional strengths are qualities that help you to manage and grow through life’s challenges. They help you to get to the other side of difficult situation. They help you to manage a stressful day. Just before Christmas I shared about gratitude and how exercising it could help you live in your upper brain. Using your emotional strengths helps you to stay in your upper brain, so that you think more clearly and decisively, feel less stressed, and experience greater calm. Other kinds of emotional strengths are patience, confidence, optimism, and resilience. Download the Emotional Strengths Finder at the bottom of this post to find out how you respond to emotional situations! You have emotional strengths – you may just not recognize them or how important they are for your well-being. Emotional strengths are not optional for good emotional health. They are essential to it! You can grow your emotional strengths. Over the next several weeks, I’ll be talking about how you can develop your strengths so that you can feel better, bounce back faster from difficulties, and can prepare for the joys (and challenges!) of parenthood. The most powerful way that humans learn is by example. Good models lead to healthy behaviours. Children learn how to be kind, resilient, patient, optimistic, and confident from parents who model emotional strengths. How do you know what your emotional strengths are? 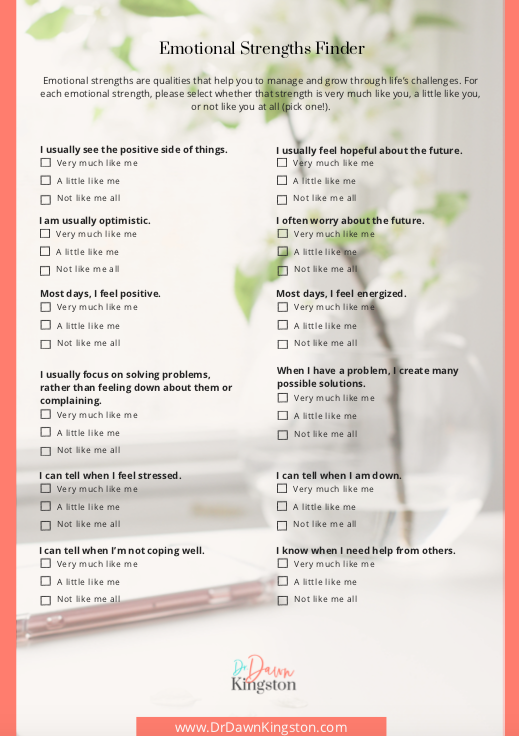 Here is a quick self-assessment (Emotional Strengths Finder) that you can do to evaluate your own emotional strengths. In less than 3 minutes you know what your greatest emotional strengths are and which you want to develop. 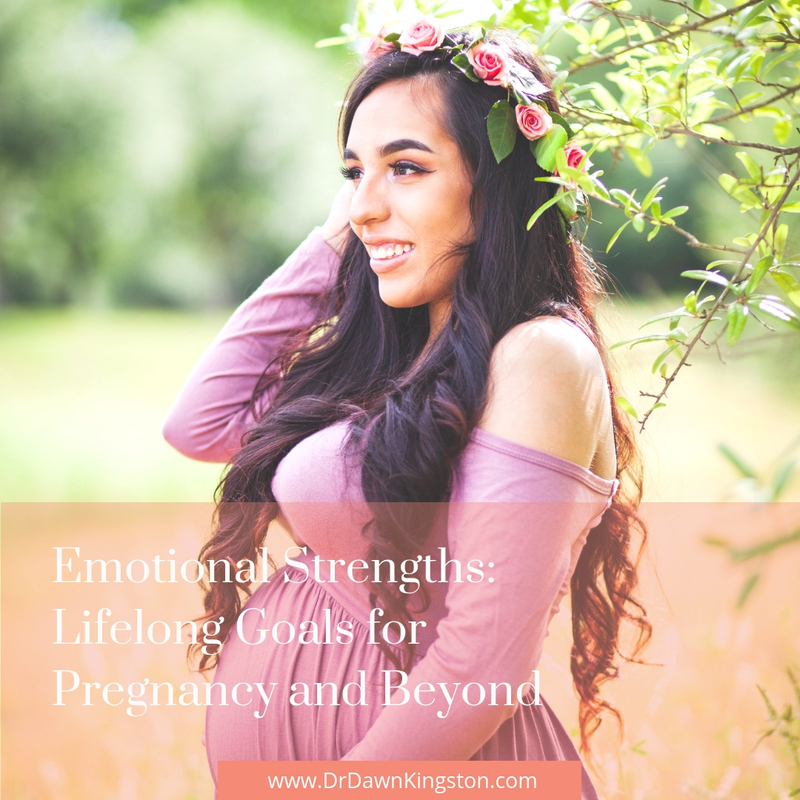 During pregnancy is a great time to develop emotional strengths that will support you as you move into parenting. I’d love to hear which emotional strengths you lean on the most in tough times. Feel free to comment below! Did you get your copy of the Emotional Strengths Finder? Get it here now! Stay tuned for my next blog post where we dive in to analyse results from the assessment!